Simple enough. I took three quarters of a cup of the sugar and caramelized it (see pictures above). The recipe then calls for you to pour in the cream and the rest of the sugar. It warns that the caramelized sugar may seize up--mine did. 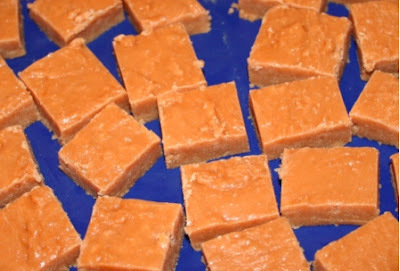 After I completed this recipe I found a couple of other burnt sugar fudge recipes. 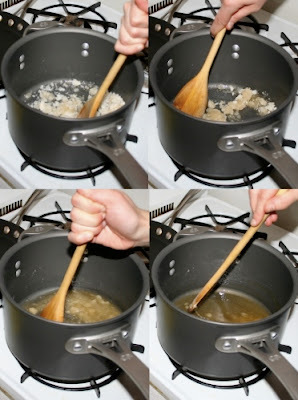 Both call for you to heat the milk and sugar together and then pour the caramelized sugar into that mixture. I'm not sure if that would have lead to less seizing--one commenter seems to have had a similar problem with a different recipe. The recipe then calls for you to heat the mixture to softball stage. I found that once I got the caramelized sugar to melt and incorporate into the bubbly mixture, the sugar was that hot already. I turned off the heat, and let the pot sit until I could comfortably touch its bottom and the mixture. I threw in the butter and vanilla and began mixing. I was disappointed to find that a layer of the sugar mixture had stuck to the bottom of the pot. I managed to wrestle the rest until it was "the consistency of icing" and no longer shiny. I poured the fudge into a greased, foiled pan (it did not fill the 8' pan fully) and refrigerated overnight. The final result is very tasty, but not perfect. I think the recipe has too much sugar and not enough fat. Additionally, there are some more crunchy sugary bits in there that got mixed in from the bottom of the pan. Maybe I'll half the Food Network recipe next to see if I get better results there. Below, the final product: imperfect but quite tasty.